The painful condition on the lower back caused by a pinched nerve is called sciatica, and it’s a common problem to many people. It can cause debilitating pain and serious mobility problems. More serious cases of sciatica can result in numbness in the upper thighs, progressive lower extremity weakness, and/or loss of bowel or bladder control (1). The sciatic nerve extends from the lumbar (lower) part of the spinal column, through the buttocks, down to the legs, which make it the largest nerve in the body. This is why this condition causes pain which spreads throughout the body, usually affecting one side at a time (2). Sciatic nerve pain can be caused by several different conditions, and quite often doctors fail to notice some of the most common causes. Sciatic nerve pressed by a herniated disk is the most common diagnosed cause of this condition. Whenever the sciatic nerve is pressed or irritated by some adjacent muscle, tumor, or bone it causes pain (3). In some cases, a healthcare provider is not able to determine the origin of the inflammation/irritation. Usually, the cause of pain is a misaligned or tight muscle. The piriformis muscle is woven through bone and other muscles, extending from the front of the sacrum through the pelvic cavity, attaching at the top of the femur and covering segment of the sciatic nerve. This is why it can sometimes be missed in the process of sciatica diagnosis. 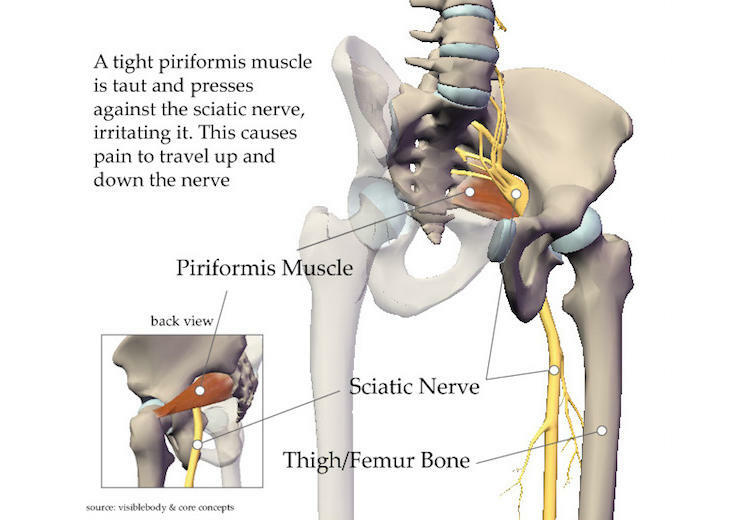 When the piriformis presses on the sciatic and other nerves in the gluteus it causes Piriformis syndrome. An experienced chiropractor, massage therapist, or osteopathic doctor should know that a misaligned piriformis can be the reason for various types of pain in the low extremities and lower back (4). Back pain caused by piriformis muscle and not a herniated disc can be treated without surgery, pharmaceuticals, or physical therapy. As any other muscle, piriformis should move too. 1. Lie down on your back and make sure your legs are in a flat position. Pull the affected leg up towards the chest, while you’re using the left hand to hold the left knee and the other hand to grasp the ankle. Pull your knee towards the other leg, leading by the ankle, until you notice a light stretch. Hold the light stretch for a half a minute, and then slowly get back to the initial position. Do this exercise 3 times. 2. Lie on the ground and cross the affected leg over the opposite one at the knees, and both legs bent. Carefully pull the lower knee up in the direction of your shoulder on the same body’s side until you feel the stretch, and hold it for a half a minute. Then, slowly get back to the initial position. Do this 3 times. 1. The plant Devil’s Claw is native to southern Africa, and has got its name from the tiny hooks which cover the fruit. The plant’s tubers and roots are used as an effective anti-inflammatory painkiller in the treatment of headaches, arthritis, and lower back pain (5). This plant can be found in natural food stores in form of powder or capsules. However, Devil’s Claw should be avoided from people who take blood-thinning medications or those suffering from peptic ulcers. 2. Inflammation and pain can be reduced with alternating cold and hot compresses. Hold an ice pack to the affected area, replace it with a heating pad, followed by the ice pack again. This will improve the blood flow in that area as well as loosen tight muscles (6). 3. Topically applied St. John’s wort is able to ease the pain. This natural anti-depressant can be found in most grocery and health food stores. You can quickly relieve the pain by massaging the affected area with an oil infusion (7). 4. Professional massage therapists have employed the trigger point therapy for releasing of muscle constriction. 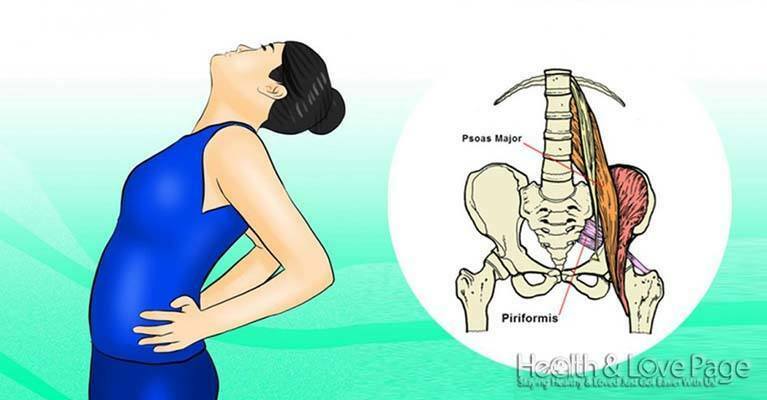 Reaching the piriformis located in the pelvis can be a little uncomfortable, but the outcome is well worth it (8). By combining stretching and massage therapy, you can return the piriformis in its place, thus lowering the pressure on the sciatic nerve and soothing the pain. More treatment options include acupuncture, chiropractic care, and yoga therapy. In case of sciatic nerve compression, it is important to use a gentle pressure, as sudden and rough movement can cause severe pain. If you combine the above strategies, you might ensure a long-term relief.